Public safety Land Mobile Radio (LMR) systems provide mission critical communications for first responders and are considered essential to manage day-to-day agency operations and response to emergency incidents. The Nationwide Public Safety Broadband Network (NPSBN) will be the first fully interoperable network supporting data, voice, and video for all first responders in the U.S. One of the proposed new services is Mission Critical Push to Talk (MCPTT), which is being designed to provide some LMR-like services which may eventually allow first responders to carry a single device to access voice, video, and data. However, comparability with existing LMR systems for voice is yet to be determined, (e.g., for coverage and direct unit to unit communications). This changing technology landscape may directly impact mission critical voice communications and the way public safety agencies interoperate with each other and with other organizations and entities. 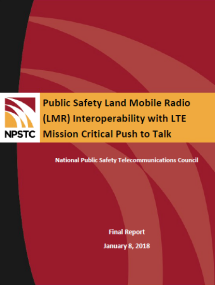 This report, Public Safety Land Mobile Radio (LMR) Interoperability with LTE Mission Critical Push to Talk, is designed to articulate the issues and requirements regarding integration and interoperability between LMR systems and LTE MCPTT services. This report does not advance a notion that all public safety agencies will migrate their LMR users to the NPSBN. However, it is clear that public safety agencies will be using a mix of LMR and LTE networks in both the short and long term and will need to have effective interoperability solutions. NPSTC authorized the creation of an LMR-LTE Integration and Interoperability Working Group in 2016 to study how first responders would communicate with the introduction of MCPTT. More than 200 participants representing public safety, industry, and academia participated in the Working Group and in the development of this report. Working Group members created use cases to examine different public safety operational scenarios involving the use of LMR and LTE PTT services. These use cases led to the creation of public safety technical requirements and a series of recommendations and conclusions. Support provided by the U.S. Department of Homeland Security's Science and Technology Directorate, Office for Interoperability and Compatibility, and the National Program and Protection Directorate, Office of Emergency Communications. Points of view or opinions expressed are those of the originators and do not necessarily represent the official position or policies of the U.S. Department of Homeland Security.